In the late 1940s, a young Nebraskan actor named Marlon Brando had been starring for several months in A Streetcar Named Desire on Broadway when he was contracted to play a fighter in a TV pilot, Come Out Fighting! For the role, Brando decided to secretly study the famous New York tough guy with the hoodlum backstory, middleweight Rocky Graziano, and began training and hanging around Stillman’s on Eighth Avenue, where Graziano’s workouts regularly packed the house. This kid took to hanging around me in Stillman’s gym, training along beside me, shooting the breeze. He looked like he might have been a fair fighter once, but he was in bad condition for the ring now and his punch looked slow. I felt sorry for the kid. He rode around town on a secondhand motorcycle, wearing patched-up blue jeans. Whenever we went downstairs for a cup of coffee or anything, I always paid for it. After about a month of training, Brando asked Rocky to take a lunchtime walk one day downtown to 46th Street, where he pointed out a name on a theater marquee. The pilot, Come Out Fighting!, was not picked up by the network, but this would not be the last impersonation of the charismatic Rocky. Before Down These Mean Streets or Manchild in the Promised Land—and long before his boyhood friend Jake La Motta’s Raging Bull—came perhaps the greatest of the New York street gang memoirs. Somebody Up There Likes Me (1955) is Graziano’s cornily-titled but harrowing survival story, tracing his journey from the East Side slums to the middleweight title by way of numerous protectories, reform schools and prisons. Written with Rowland Barber, the book is fantastically observed, by turns violent, funny and filled with rage, like the Rock himself, and competed for that year’s Pulitzer Prize. Rocky Bob, as he was then known, was unloaded on his grandparents, moving from Brooklyn to the Lower East Side. There he found more than enough to eat, which was a novelty, as well as his own room. But in the streets below their tenement windows he and his 10th Street mob lived a different life, making easy thefts from pushcarts and mom-and-pop stores, social clubs and subway vending machines. “We stole everything that began with an ‘a’ ,” he remembered. “[A] piece of fruit, a bicycle, a watch, anything that was not nailed down.” Often they escaped to the rooftops to split the loot. After hearing that Peter Stuyvesant had been buried with his silver peg leg and gold watch, young Rocky and a friend bought shovels and spent most of a night digging up Peter’s churchyard plot until a nightwatchman spoiled their treasure hunt. Even when he wasn’t in trouble, Rocky was often in danger—twice hit by cars while playing in the street; once, when his running rooftop leap fell short; Rocky only survived by hitting a series of clotheslines on his way down. He became a veteran of children’s court, protectories, the Tombs, Raymond Street Jail, Rikers Island, and Coxsackie reform school, where he was reunited with his friend Jake La Motta, who used to come down from the Bronx to go on thieving adventures with Rocky on the Lower East Side. At Coxsackie, La Motta supplied him with comic books for his stretches in the hole. “It was a long time,” Rocky explained later, “… before I learned that boxing was the only way to burn up all this energy that used to steam around inside of me.” Baited by friends into entering a boxing tournament, he became city welterweight amateur champion, then hocked his medal. Between 1942 and 1944 he went 35 and 6 (with five draws) and by 1945 was a crowd favorite, a volatile boxer with a right hand powerful enough to compensate for his lack of polish. His knockout win over welterweight champion Freddie Cochrane (in a non-title bout) was Ring Magazine’s Fight of the Year for 1945; he fought him again two months later with the same result. He beat Al “Bummy” Davis and then retired Marty Servo, leaving Rocky as the top challenger to Tony Zale, returning from the war to defend his frozen middleweight championship. Their great rivalry would now begin. Excited to cover the big bout in 1946, New York Sun columnist W.C. Heinz got his own break when the great Damon Runyon, though mute with throat cancer, recommended him on a cocktail napkin to the editor of Cosmopolitan for an assignment. Having mastered the format of the 750-word sports column, Heinz knew Zale and Graziano were fighters whose styles would “mesh like gears.” Rocky could carry the kind of epic story he had in mind, “Day of the Fight,” which eventually ran to 6,000 words, reporting the Rock’s words and movements for an entire anxious day, from opening his eyes in the hotel room that morning to having them closed by Zale under the lights at Yankee Stadium that night in the sixth round of “one of the most brutal fights ever seen in New York.” With “Day of the Fight,” Heinz discovered the kind of long, beautifully observed profile he would do the rest of his career. After the excitement caused by their vicious first bout, Graziano and Zale agreed to meet again for the title on July 16, 1947. Rocky had meanwhile lost his boxing license in New York for failing to report bribe offers allegedly made at Stillman’s over a fight that ultimately did not come off. The National Boxing Association did not at first honor New York’s decision, and so the rematch was made for Chicago. It was as savage as its predecessor and would be Fight of the Year for 1947. A generation of moviegoers who never saw Rocky in action would nevertheless recognize one dramatic moment from the rematch. Between the 4th and 5th rounds, with Graziano bleeding above his left eye and with his right one swollen closed, his trainer opened the eye with the edge of a quarter he retrieved from his pocket. (This scene was copied by Sylvester Stallone for Rocky, whose hero’s name, Rocky Balboa, also echoes Graziano’s original Rocco Barbella.) Cutting the eye lowered the swelling enough that Rocky could drop Zale in the sixth round and then pound him out against the ropes with 30 unanswered punches. Then, standing in the bright, hot ring and looking more like the fight’s pulpy-faced loser than the new middleweight champion of the world, Graziano was offered a radio mike into which he made the triumphant boast that came to define him: “Hey Ma—Your bad boy done it. I told you somebody up there likes me.” Somebody had taken a long time to show it. The writer Gerald Early first pointed out (in an essay called “The Romance of Toughness”) the fact that Marlon Brando, James Dean, and Paul Newman all studied the Rock for acting roles. After Brando came Dean, hired to play Rocky for Robert Wise’s film of Somebody Up There Likes Me. Dean had just begun researching the character when he died in a crash of his Porsche convertible in California in Sept. 1955. 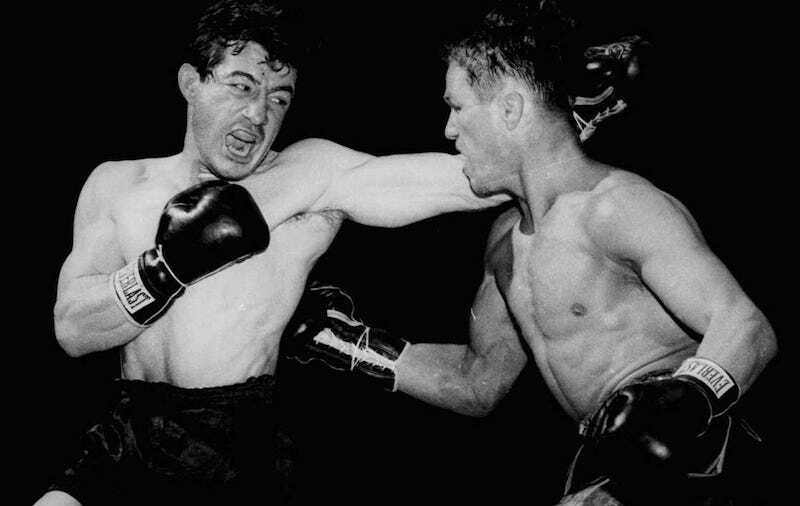 Newman (who first replaced Dean as a boxer in a TV adaptation of Hemingway’s “The Battler”) was then cast in the part that made his career. The 1956 film of Graziano’s life received excellent reviews, as did its star Paul Newman. Rocky, of course, loved the movie, which opens with his on-screen testimonial: “This is the way I remember it…definitely.” Only one writer who’d known the real Rocky early on, W.C. Heinz, felt that something of his wise-guy charm was missing from the performance. Newman had “caught the sullen moods,” he wrote, “but not the exuberance that made the fighter exciting just walking down the street.” You can’t learn that exactly, but many have tried. Nathan Ward is the Brooklyn-based author of The Lost Detective: Becoming Dashiell Hammett (Bloomsbury, 2015) which was excerpted in Deadspin in September.